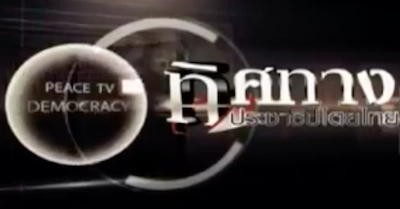 Peace TV, a television station operated by the red-shirt UDD movement, has had its broadcasting licence suspended yet again. The National Broadcasting and Telecommunications Commission announced that Peace TV must cease broadcasting for fifteen days, from midnight tonight. The NBTC's ruling relates to three episodes of Democracy (ทิศทางประชาธิปไตย), broadcast on 4th, 10th, and 11th October 2017. The channel's licence was suspended for thirty days last year and in 2016. Its licence was revoked in 2015, though that ruling was overturned by the Administrative Court.